Noureen Noorani - Wolfsohn Accounting and Advisory Services, Inc.Wolfsohn Accounting and Advisory Services, Inc.
Noureen Noorani is a Senior Accountant at Wolfsohn Financial Services Inc. Noureen has a Bachelor’s in Business Management Studies with a major in Finance and a Master of Commerce Degree with a Major in Management & Accounting. With 9 years of successful experience in public accounting, she has skills in key commercial areas such as preparing tax returns, financial statements, tax planning, and responding to audits & letters. 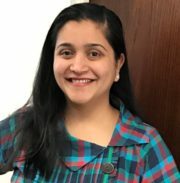 Noureen is a highly organized and self –driven individual with understanding of accounting principles, familiarity with federal and state laws/regulations, is computer literate and has extensive experience with several different accounting programs. Noureen provides outstanding customer service by combining effective communication skills with functional knowledge to identify opportunities and deliver a satisfactory outcome. © 2019 Wolfsohn Accounting and Advisory Services, Inc.